KNEE-JERK-REACTION: Ummm... we should have gone to our favorite Steak House -- RUTH'S CHRIS @Restaurant Row. Husband and I have a few things to celebrate so we decided to do it at Hy's Steak House in Waikiki last night. We celebrate my successfully passing the SAP Certification Exam. Second, husband got a new job. Yayy for celebrating great achievements! LOCATION: Hy's is housed on the first floor of a condominium on Kuhio Ave in Waikiki. It is not the most convenient place to get to. A simple google search will get you there without a problem. Let the GPS guide you. PARKING: Free valet -- nice touch! DRESS CODE: Men are required to wear collared shirts. Based on the other women that were in the dining room, we aren't required to wear anything special. I saw women there with khaki capri pants and tshirts. **shrugs** Why did I go through the trouble of dressing up when, apparently, women can wear whatever they want? RESERVATIONS: Yes! We did it online, through the Hy's website, "powered by OpenTable". AMBIANCE: Dark. I felt like I was in an old white man's cigar room. The walls are beautifully finished wood and shelves filled with old books. There are paintings of white men with long white hair. Personally, I did not care for the art work on the wall. It would have been sufficient to feature the wood finishes and the shelving and books. The noise level was nice. It could be because we were seated, as requested, in a corner booth. SERVICE: The staff were attentive but not friendly. Contrived? Yes! They were all trying a little too hard. Some of them felt..... rehearsed like they say the same thing to the guests over and over. And every dish you select is their favorite. **rolling my eyes** We interacted with five different servers throughout the evening. Stewart took our drink order, delivered on the waters then took our order for the rest of the evening. 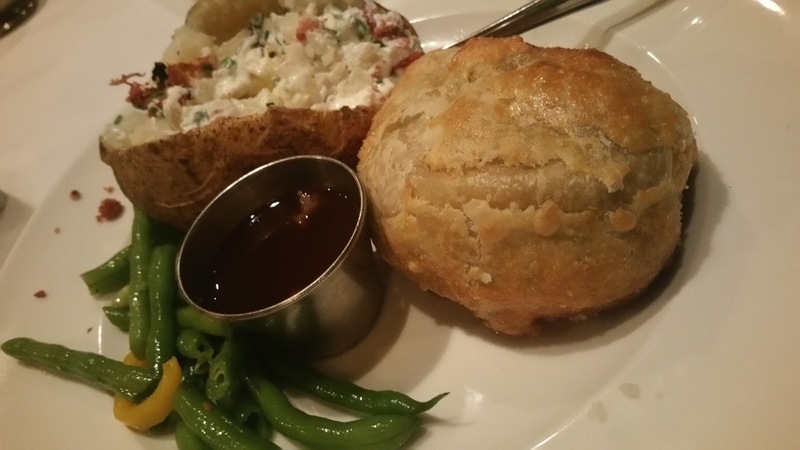 The timing between delivery of appetizer to delivery of the entree was about thirty minutes. I am disappointed with that. What was even crazier is that not one server had come to tell us how long it would be or if we would like to order a drink. We just sat there until the entree was served. 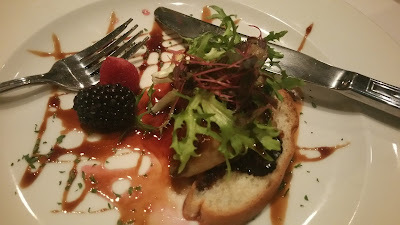 FOOD: For appetizer, I ordered the Duck Foie Gras with Poached Figs and Brioche. This dish was one of two reasons we went with Hy's instead of going to my favorite place - Ruth's Chris. The one thing that came out of this one and only visit to Hy's is my new obsession with Foie Gras. It is, by far, the most delicious thing I have tasted in a very, very long time. If I do ever go back to Hy's, it will be for the Foie Gras. Even though it was an extremely tiny serving, it was very delicious. Husbands appetizer was the Lobster Bisque. They only prepare this for the weekend crowd so of course we had to try it. It was tasty. I wish they had served it with crackers or toast. It needed some crunch for texture. A slice of toasted baguette would have been really nice to go with it. I ordered Beef Wellington for my entree. I ordered it medium-rare. It came well done. There was not an ounce of pink. :-( I was supremely disappointed by this but did not want to make a fuss cause I was darn hungry. Ugghhh!!! This dish lacked seasoning! I should have ordered horse radish cream to go with it because it was so bland. Even the buttery crust did not add much flavor. 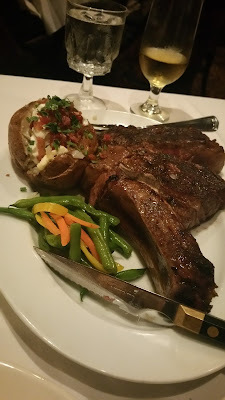 Husband had the 32oz Bone-In Ribeye. His, oddly, was medium-rare and he ordered his medium-well. Husband also did not make a fuss because he was darn hungry! Sad to say, the steak was not seasoned very well. We were all kinds of disappointed. We didn't even bother to look at the dessert menu. SUMMARY REVIEW: I would skip Hy's. The service is not exceptional. The food even less than that. What I liked most about my trip there was the foie gras and the valet parking and that's it.